Situated in Klaasvoogds West, in the Roberston Wine region, Mo & Rose is a wine bistro and boutique guest house. We needed to eat dinner after our champagne ‘making’ at Weltevrede and we asked the guest house owner for a suggestion. There is only one place to eat in Bonnievale and this did not really meet our expectation of a decent dinner out. 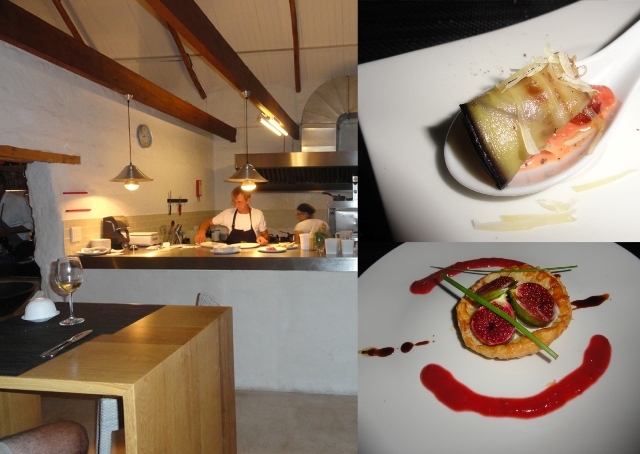 We were told at Weltevrede to try Mo & Rose and so we took a drive and hoped for the best. The setting is stunning and the area tranquil and serene, and we could not have asked for a better night to spend dining under the stars. It was not the warmest of evenings but I was given a blanket to wrap around myself to keep warm. Overall, our evening was very pleasant. The menu is concise with a choice of 6 starters, 7 main courses and 3 desserts, ensuring freshness. Local ingredients are used which is a huge plus for me. The amuse bouche was baked aubergine. It had an overwhelming taste of tomatoes and was served with capers. I started with a fig tarte with gorgonzola cheese and fruit chutney (R50). The pastry was lovely and the figs came from trees on the estate. It was a bit heavy on the cheese and served with a strawberry sauce. Personally I felt that it needed a bit of acid. 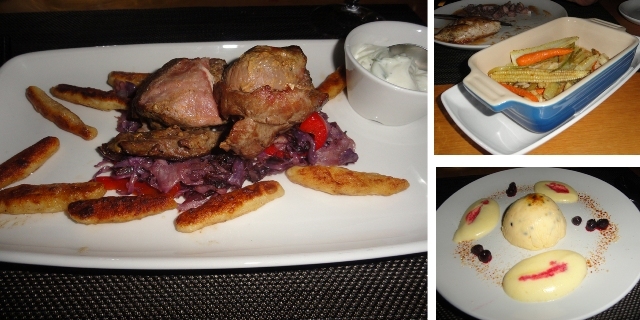 For mains I had the lamb roulade with red cabbage stir fry and ‘schupfnudeln’ (R125). The noodles had the same texture as halloumi and the lamb was tasty even though some of it was tough. There was a lot of lamb, and it was generously seasoned with pepper. Sadly the cabbage albeit tasty, was very oily, and the meal was served on cold plates. The vegetable side order was crunchy and included fennel which I love. Our predessert taster was a peach sorbet with Weltevrede brut rose. A wonderful combination of flavours. For dessert I chose the passionfruit parfait with a naartjie sabayon (R50). The paarfait itself was smooth but I did find a few pips in it which personally I don’t mind. The sabayon was warm and acidic and I could taste the alcohol, however I could not taste the naartjie. It had been brûléed and was the inspiration for me to try my hand at making some. The wine list is pretty good and showcases local wines. We chose the Quando Pinot Noir at R120 for the bottle. The wine is fruity with a peppery nose. Wine is also available per glass. Our wine was poured correctly but then the waiter put the screwtop back on the bottle. This is a big no no for me as far as etiquette goes. The service is slow but competent. Dining under the stars makes an evening special and the evening was made more romantic by the large glass jar on the table with a light in the lid. This is so much better than a flickering candle. There is an open plan kitchen but you never get a sense of anything but calm when in the inside dining area of the restaurant. And… book one of the three guest cottages for an overnight stay so that you can really enjoy the wines on offer.